There were once some wild Bees who lived in the hollow of a tree. One day, a Bear who thought himself very strong, learned about it and came to see them. "You are very tiny and weak, Bees!" he said. "So you must give me your honey of your own free will. If you don’t, I'll uproot the tree, take the honey by force and kill you all!" 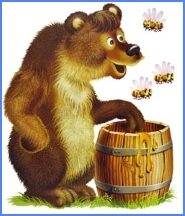 That the Bees should be so cheeky enraged the Bear. He thrust his head into the hollow and stuck out his tongue to get at the honey, but the Bees flew at him and stung his tongue, ears and nose so hard that the pain of it made him forget how strong he was. "Don't you ever forget, Bear, that even the tiniest creatures know how to defend themselves!". Now, the lesson to be learned from this story is that there is strength in unity and that however weak you may be by yourself, together with others like yourself you will be strong and able to withstand any enemy.